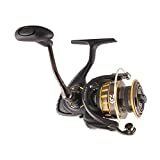 Are you looking to find the best spinning reel under 150 dollars? For a price of 150 dollars, you can get a solid spinning reel that’ll last for years with proper maintenance. These options shown are all solid investments that will perform. 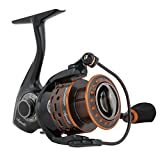 All of these reels on this page are designed for around 8 pound test line and therefore would be good all around fishing reels for bass, walleyes, northern pike, and most other freshwater species. We have written this guide to help you find the perfect spinning rod for your needs under 150 dollars. We will be considering weight, gear ratio, line capacity, and everything else that makes a great spinning reel. It always helps to visually compare the options. We will use this table to highlight our top candidates for the best spinning reel under 150 dollars. If you are choosing a reel for the first time or need a refresher, click here to learn more about how to choose the proper spinning reel for you first. This full-metal reel combines a beautiful appearance with durability and smoothness. With 8 high quality ball bearings plus one roller bearing, the Clash should be smooth as butter. It is made out of all metal for durability. The handle is covered with foam for comfort on a long day on the water. It is probably the best spinning reel under 150 dollars. This specific model, the 2500, is the heaviest out of these three reels, weighing in at 8.5 ounces due to it’s full metal construction. It has a gear ratio of 6.2:1, which is a very good middle ground for gear ratios, not too fast and not to slow. This will help this reel pull in 33 full inches of line per full turn of the handle. The line capacity is great, holding 175 yards of 8 pound test monofilament. The drag system is smooth and can be tightened to withstand as much as 12 pounds of pressure. As you can see in the picture, the drag knob is easy to access while fighting a fish. With almost no knocks, this reel is going to be a solid purchase for years to come. The all-metal construction should help it last for years, while the amount and quality of bearings should make it silky smooth for that time period as well, and the awesome look it has will have your buddies drooling. For all of these reasons, the Penn Clash spinning reel is the best spinning reel under 150 dollars. Another smooth reel by another top manufacturer, the Abu Garcia Revo SX in the 30 size is a good option for your next reel as well. Our lightest model at only 7.9 ounces, this reel is also beautiful and will look great on any rod. The handle is ergonomically covered with foam. 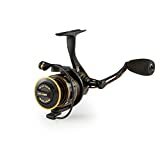 This reel is designed to hold 175 yards of 8 pound test line as well, and has a gear ratio of 6.2:1, a great middle ground for reels between power and speed. This will haul in 35 inches of line per turn. The drag system will hold pressure of up to 11 pounds, and the drag knob is also easy to grip when you need to. The drag is made of carbon and is very smooth as well. Abu Garcia did something unique with the bail to help with line propulsion – if you take a look at the lip of the bail, it is curled forward to provide no resistance when line is coming off. This is another great option for a reel, being very similar to the Penn Clash – same retrieve ratio, but this will actually pull in more line per turn. It’s also lighter. The drag system is a little lighter but not significantly, and the looks of this reel are also highly attractive. You’ll find it’s one of the top spinning reels under 150 dollars. One of Pflueger’s top reels, the Supreme XT is a fishing machine. This reel actually has 9 ball bearings plus one roller bearing to make it one of the smoothest reels on the market. It also has the 6.2:1 gear ratio, which is a perfect midpoint between power and speed, and each full turn of the handle will bring in 33.8″. The body of this reel is made from magnesium for strength yet still being very lightweight. The only caution with magnesium is not to use it around saltwater, which will corrode it very quickly. At 8 ounces, this is a very light reel. It will actually hold 185 yards of 8 pound test, which is 10 more than the other two reels hold. Pflueger has been known for years for only making some of the smoothest reels on the market, and this one is no different. The Shimano Stradic has been a reliable reel for years for fisherman all over the world! It’s smooth and powerful, and it comes at a great price. Here, we will discuss the 2500 model, but you can get sizes as small as the 1000 up to the 5000. We find that the 2500 is probably the most commonly used for freshwater fishing. They have 6 high quality ball bearings to make it smooth, and it can retrieve 35 inches of line per rotation of the handle. This of course depends on the size you get and how much line you have on it. The standard gear ratio on these is 6:1, meaning the spool will spin 6 full times for each rotation of the handle. That makes this good all-around reel – not too slow, but still with plenty of reeling power. The max drag is 20 pounds, and it’s a front drag system. The 2500 model weighs 8.3 ounces, which is a fairly standard weight for reels this size. All in all, this is a great reel coming from a great manufacturer that should serve you for years! Any Shimano option is a great choice for the best spinning reel under 150 dollars. 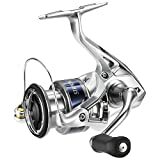 Braided Line Ready Spool, Waterproof Drag System, Carbon ATD, Line Per Handle Turn: 37.4"
Daiwa is well-known for their precision and quality manufactured reels, and the Daiwa BG is their original spinning reel. In fact, they also make a baitcasting reel under the same name that is also outstanding. Here, we will review the 3000 model as well, because that is the size most people end up using for freshwater fishing. Granted, this reel is very versatile and can be used for different types of fishing. The gear ratio on this is 5.6:1 which is a happy medium of speed and power for a multipurpose reel. The Daiwa BG spinning reel also has the largest drive gear in the history of Daiwa spinning reels. This reel is very durable and will be casting well for years to come. The BG3000 model weighs in at 12.8 ounces, which isn’t too crazy out of the ordinary, though definitely the heaviest reel here. 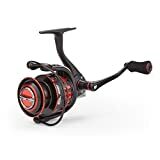 The price is right if you are looking to save a little more money and don’t mind a little extra weight, and you’ll definitely get the performance out of this reel that you’re looking for! All of these reels would be a great option for the best spinning reel under 150 dollars on the market. They’ll get the job done and more. Choose the one that you like best, whether that’s just looks, weight, line capacity, or retrieve rate. Good luck and good luck fishing!